Two loose-cannon narcotics cops investigate the flow of Ecstacy into Florida. A lot of gun slinging, tyre burning and fast talking action. This is a full power action movie. Not a lot of plot, but a whole lot of action. 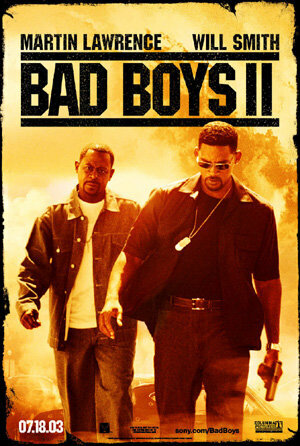 The comedy is a bit lighter than the first Bad Boys, but the action is a whole lot more heavy! I am a bit fan of Will Smith - ever since Fresh Prince. He does a good job here, but not as good as in the first one. I am not a big fan of Martin Lawrence as I personally think that he severely overplays any part he is in. It might be the writing or it could just be the man. AS mentioned this movie is serious on the action, and the effects are through the roof. It is a bit over the top for my opinion, but if you like crazy wild and absurd explosions, I guess this will be one for you. Watch it for the action with a adrenalin addicted friends of your. I must admit that I only bought the DVD (used) due the fact that it features one of my heroes Henry Rollins. I saw it in the theatre originally back in 2003, and that would have been enough for me. Want us to review something?